NederBet Casino offers games in association with some of the biggest casino game developers (for example: NetEnt & Microgaming). It wants to be the undisputed chamption in the area of online casino entertainment. But it's website could be easily overlooked by players who are looking for a more flashy intro page. After all, the main page graphics are not all that attractive. The whole site is designed in a very simple manner. Nevertheless, the appeal of the casino has to do with the content that can be found inside. A careful selection of games shows that the casino staff is knowledgable and competent. They seem to know about the latest trends and patterns in the online casino world. 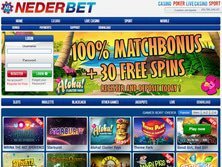 Instant profits are offered to first-time players who are introduced to the NederBet Casino bonus deals. For example, the casino promises to double the deposit amount with its 100% first deposit bonus deal. 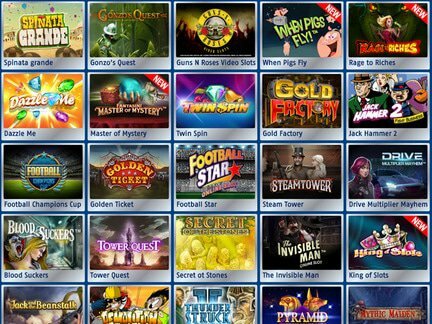 Furthermore, the site provides free spins to new members of the casino. Seven free spins can be granted on a weekly basis. Special promotions are also associated with certain games. Fifty free spins can be earned while playing Gonzo's Quest. The Rock N Roulette game provides twenty free spins to anyone who manages to pick the lucky 21 number. Such deals are the norm inside the online casino. However, the aformentioned deals are not available all the time. Since the promotional offers keeps on changing, it is good to go back to the site on a regular basis. The venue has enabled a number of secure payment options for players who feel ready to make a bet. The methods would include; Visa, MasterCard, Skrill, Neteller, PaySafeCard, etc. When it comes to security, the Secure Socket Layer guarantees that the financial transactions will be entirely safe. In some countries gambling activity is illegal. The casino staff makes it clear that it is the player's responsibility to check the relevant laws of a given country before registering the website. But the specific country restrictions are not published anywhere on the website. Since the € is the currency on display, it is evident that the online casino is making inroads into Europe. The players from the Netherlands are particularly visible, but plenty of traffic comes from visitors from other EU member states. There is also a significant number of players that visit the website from Canada. Apparently, the website does a good job in addressing their needs. On the site, the players can sort of the games and see which ones have received the most traffic. The popular game category features the following game titles; Starburst, Blood Suckers, Golden Ticket, Gonzo's Quest, Dazzle Me, Twin Spin, Jack Hammer, Gold Factory, Tower Quest, Spinata Grande, Adv Roulette Lo, Mythic Maiden, Evolution Live Blakcjack, Evolution Live Roulette, Gemix, Wild Rockets, Hook's Heroes, Jack and the Beanstalk, South Park, Neon Staxx, Thief, Dr. Jekyll and Mr. Hyde, Sparks, Thunderstruck II & Reel Rush. The main game categories would include; Roulette, Blackjack, Other Games, Jackpots and Live Games. The last game category is particularly interesting. A whole new level of entertainment is available with the live dealer game titles. The Dutch online casino & sportsbook has been criticized for the lack of pooled jackpots and issues with withdrawals. It has received mixed reviews from players. The casino takes all these complaints seriously. They can be reported to the staff via e-mail. In fact, the account manager can be contacted directly. Unfortunately, the support section does not show any phone numbers. Live chat is likewise unavailable. Therefore, the customer support options are limited. The licence was obtained from Curacao e-Gaming under W.L. Services N.V. This license provides the required legal protection. Regrettably, it does not carry any significant authority in the world of online casino gaming. The licensing jurisdiction is known for authoririzing the activity of various new casinos. It's approval process is not known to be all that rigorous. I found the NederBet Casino website to be highly entertaining. The live games were especially good! I was a little less enthusiastic when I saw the promotions section. A very low number of promotions were shown in that section. However, I am sure that this problem can be resolved down the road, as the casino grows. In my opinion, the first deposit bonus deal was actully quite decent. I also have a bit of problem with the fact that the casino went for the license that was easy to obtain instead of seeking quality assurance.